If you or your son or daughter are interested in joining the ever-growing graphic design industry, now is as good a time as any. Graphic design is one of the fastest-growing fields in the professional world, and building a reputation as a reliable graphic designer can guarantee you a successful career. But you can’t jump into the graphic design industry without the education and experience to keep you afloat. 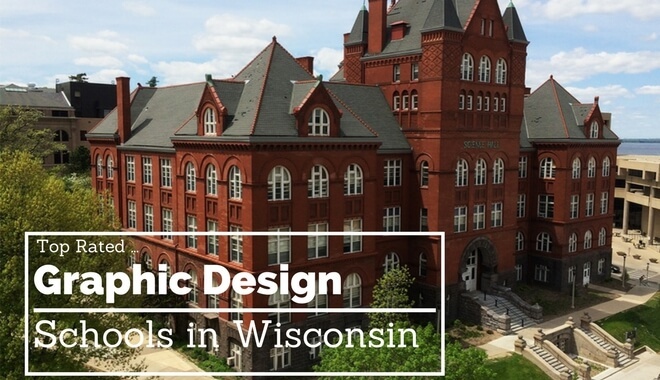 Here are the top institutions for a graphic design certificate or degree in Wisconsin, so that you can find the best place to secure your degree today. The Bachelor of Arts in Graphic Design program offered by Concordia University develops students who can apply their passion, imagination, and creativity in visual art and design to the practical aspects of a graphic design career. Concordia University offers students a state-of-the-art program with the latest facilities, technologies, and software, underlined with a Christian learning experience. With the on-campus graphic design lab, advanced design classes, and direct field experience with internship help, this program appreciates the out-of-classroom experience and believes it to be crucial in evolving one’s visual art skills and appreciation. The Bachelor of Fine Arts in Graphic Design and Interactive Media program offered by University of Wisconsin – Stout has been developing students who have significantly impacted the art world of the Midwest for over half a century. This program is the largest undergraduate art program in Wisconsin, and it allows students to tailor their education in Graphic Design and Interactive Media as they see fit, choosing which theoretical and technical aspects of graphic design they will pursue. Students will experience a number of design skills, including those related to web design, motion graphics, packaging, publishing, advertising, and more. There are several out-of-classroom experiences, including direct work with faculty with decades of experience in graphic design, as well as the latest equipment and software to fully complete their projects. The Bachelor of Arts in Graphic Design program offered by Mount Mary University emphasizes on developing students who have a global perspective of the graphic design field. Students can expect to develop professional skills and fundamental art competencies that will equip them with the ability to work with local and international clients and companies. Students are allowed access to state-of-the-art computer labs with which they will learn graphic design software such as Adobe Creative Suite. The primary mission of this program is to ensure that students develop themselves artistically through professional communication. The Bachelor of Arts in Graphic Design program offered by Marian University combines skill and knowledge in graphic design with the values and fundamentals of traditional studio art. There is an emphasis on developing the personality, art style, and voice of each student in the program. Graphic Design students are taught the foundations of the fine arts and are encouraged to use this understanding with modern applications, including typography, layout, and software-aided design. Students are expected to complete both a portfolio that showcases all of their skills as well as an internship with a professional graphic design-related company. The Bachelor of Arts in Graphic Design program offered by St. Norbert College involves many long hours beyond classroom coursework, where students are expected to work solo and in collaboration on projects with other teams to express and develop their graphic design potentials. This program offers a distinctive educational experience in both graphic design and fine arts, and students are encouraged to understand both in the hopes of developing the most complete and thorough education. Students are taught to recognize principles of line, color, texture, shape, scale, and other fundamental art and design elements, and learn how to apply this heightened sensitivity towards creating the most effective visual graphic designs. The Bachelor of Arts in Graphic Design program offered by Edgewood University is a liberal arts program that helps students successfully enter the graphic design workforce. It does so by equipping its students with a balance of creative expression and technical skills. Faculty in this program are well-known practicing artists and professional, with decades of combined experiences in the graphic design industry. Throughout this program, students can expect to gain real-world experience through work-study jobs on campus around the university, as well as internships with professional organizations and companies in the region. Graphic Design students can expect to have certain skills developed, including videography, photography, painting, drawing, coding, web design, typography, layout, design, and art history appreciation. The Bachelor of Arts in Graphic Design program offered by Cardinal Stritch University recognizes the importance of creating students who are fully aware of the increasingly complex Graphic Design world and its relation across multiple professional platforms. The program fully embraces the latest technologies and software related to studio art, photography, and graphic design, as well as time-based and digital media. Students are taught both how to work independently and with creative teams and can expect to be personally and closely guided by experienced faculty as they tackle complicated graphic design and visual communication theoretical and practical problems. The Bachelor of Arts in Graphic Design program offered by Northland College exposes students to the latest and fastest-growing branch of visual communication and aims to develop students who are more than qualified to enter the graphic design industry. This program explores graphic design solutions for real-world visual problems. It does so by solving project problems through both traditional and digital design solutions across multiple platforms, including interactive media, web, advertising, branding and identity creation, publication design, and more. Finally, this program aims to create a design center within the university that most effectively connects students with campus researchers, government agencies, and regional nonprofits with graphic design needs during their stay. The Bachelor of Arts in Graphic Design program offered by Silver Lake College focuses on design principles, professional practice, graphic design and art history, and critical thinking. Students may expect to be introduced to a professional and creative learning environment where they can best develop their command of visual communication with design and art principles, combining their visual art with aspects of technology, imagination, and theory. Graduates of this program are prepared to competitively secure full-time work in the graphic design industry. The Bachelor of Arts in Graphic Design program offered by the University of Wisconsin – Parkside equips students with the ability to join the recent rise of the graphic design industry, with all the skills and abilities required to solve modern graphic design problems. Students of this program will take courses in both studio art and those specific to certain graphic design disciplines, such as branding, layout, and typography. This can be considered a multi-faceted program, where students may choose from a wide variety of courses that will educate them in everything from the history of traditional print media to the latest software and technological solutions to video, digital art, and web design.